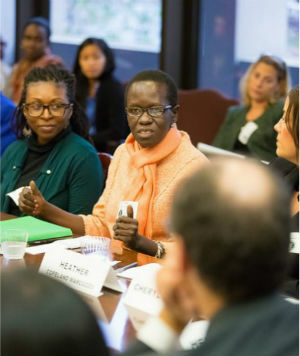 Grace Rutha came to the United States as a political asylee, seeking refuge and a chance to pursue the “American Dream.” Despite her background as a News Editor in Kenya – with 13 years of experience and a Master’s Degree in Journalism from the University of Nairobi – Grace was unable to find work in her field, and remained unemployed as a refugee with a work permit and then a Green Card. Grace has been HIV positive since the age of 20. Seeking medical assistance, she found Philadelphia FIGHT – a comprehensive health services organization providing primary care, consumer education, research, and advocacy for people living with HIV/AIDS and those at high risk – enrolled Grace as a patient. She became actively involved with FIGHT, and is now a member of FIGHT’s Advisory Board. When Philadelphia FIGHT partnered with the District 1199C Training & Upgrading Fund to implement the first Community Health Worker Registered Apprenticeship in Pennsylvania, FIGHT identified Grace as its first Apprentice. She has completed the 150-hour classroom training, and is currently working as a Community Health Worker Apprentice in an HIV Peer Counselor role. Georgia Dunbar began college at Temple University in 1985, with plans to become a doctor. Unfortunately, she was forced to leave school after one year due to personal circumstances, taking a job as a Medical Records Clerk and working there until her facility closed. Georgia returned to college again to study nursing, but had to leave once more when her mother fell ill. While caring for her mother and her own young child, Georgia discovered an interest in medical technology. She returned to school once more, this time to study X-ray technology. After graduating, she found work at Penn Medicine, as well as Haverford MRI. She worked these two jobs until her mother became terminally ill, resigning to care for her family full-time. Georgia was unemployed for a full year before accepting a part-time job at UPS, to take advantage of their tuition benefit. This benefit – as well as a scholarship for previously long-term unemployed students, available through a US Department of Labor-sponsored Training Fund program – helped Georgia pay her tuition when she enrolled in the District 1199C Training & Upgrading Fund’s Practical Nursing School in 2011. Georgia graduated from the Training Fund’s Practical Nursing School in Fall 2013, prepared to embrace her promising future as a new LPN. One day during her last semester of the program, Georgia’s class participation so impressed visiting employer Yvonne Jones of Urban Solutions, Inc. (a community-based primary care provider) that she was offered a job as an LPN on the spot – before she’d even completed her education! 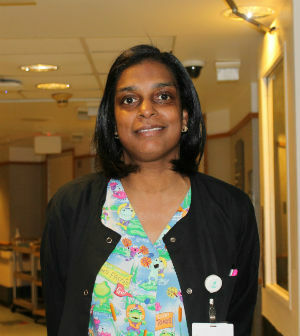 After graduation, Georgia began working at Urban as an LPN earning $20 per hour, and was soon offered additional responsibility helping Urban implement a new Electronic Health Record system. In November 2014, Georgia continued her journey along the Nursing Career Pathway, accepted a position as an LPN Charge Nurse at Inglis, a specialized long-term care facility. Today, Georgia earns $26 per hour and full benefits. She has come a long way from the $10-$12 per hour part time jobs of her life before LPN school, and has an even brighter future in the nursing field to look forward to.